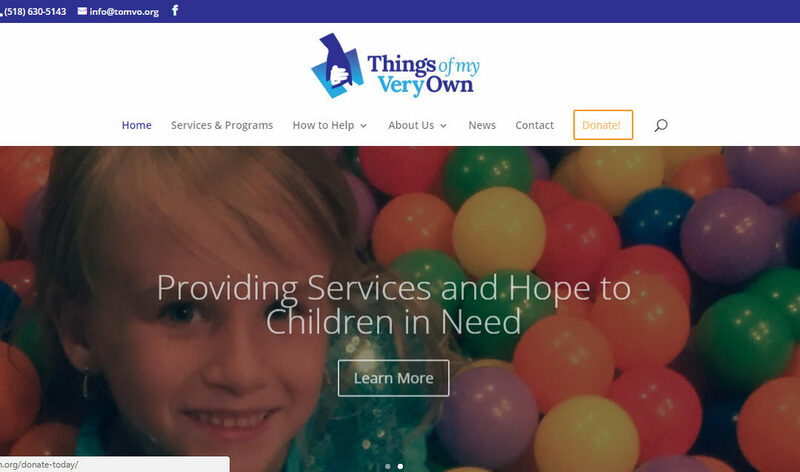 We recently completed a thorough revamp for Schenectady non-profit Things of My Very Own, Inc. The site had been a Wild Apricot site. The organization found it did not offer the design flexibility they wanted; nor was the site mobile friendly. We updated the site to the WordPress content management system or CMS. Using material that was on the existing site and additional content provided by the organization, we deployed an easy-to-navigate, attractive, responsive (mobile-friendly) site. One important consideration for the organization is the receipt of donations. We deployed a premium plugin, Give, which allows Things of My Very Own to set up different campaigns and accept one-time and recurring donations with ease. On request we gave the organization’s Facebook feed a prominent place on the homepage. With thousands of followers on the social media platform, it’s the primary way Things of My Very Own communicates with the public. We also integrated many YouTube videos on the site. The videos help to tell the compelling story of how this organization helps children in dire need of life basics. Things of My Very Own opted to have GoatCloud host the site and to manage the WordPress installation, ensuring backups, updated software, performance and security. Visit Things of My Very Own today! Update March 2018 – The site is now secure and renders only as HTTPS. And, owing to the virality of an organizational campaign during this past holiday season, the site for a few weeks saw site traffic spike by a factor of over 100. The tens of thousands of visitors during a short period never interrupted the site, and donations were received apace.